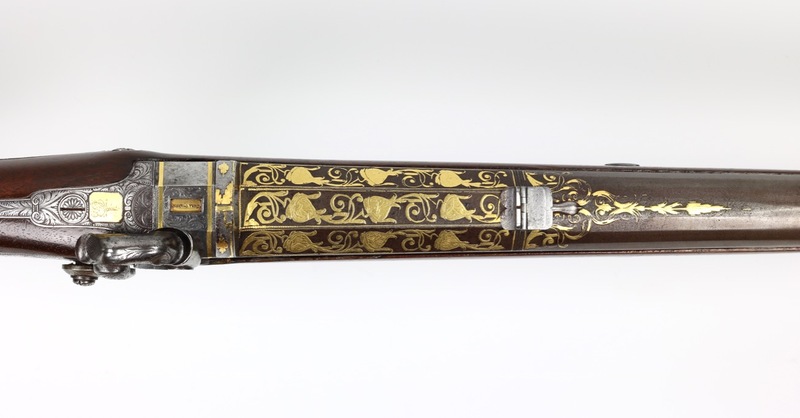 In the Ottoman-Habsburg wars of the 16th century, European observers noticed the range and force of Ottoman rifles were superior to those made in Europe. This was in part ascribed to the construction of the barrels where rods of layered steel were twisted and subsequently forge-welded into a coil. This made the barrels less likely to delaminate under pressure, effectively enabling it to use higher charges. Word spread quickly and Ottoman barrels became highly sought-after in Europe, to be mounted in European fashion and with the latest European locks, which were preferred by this audience. Eventually, Europeans gunsmiths also learned how to produce similar barrels themselves but the appeal of genuine Ottoman barrels remained. Robert Elgood, Firearms of the Islamic world , page 38 and The Arms of Greece pages 78, 80 and 81. Origin: Barrel: Ottoman. Lock & stock: English. Materials: Steel, gold, wood, silver, brass. Dating: Barrel: Second half 18th century. Lock & stock: 1810's - 1820's. 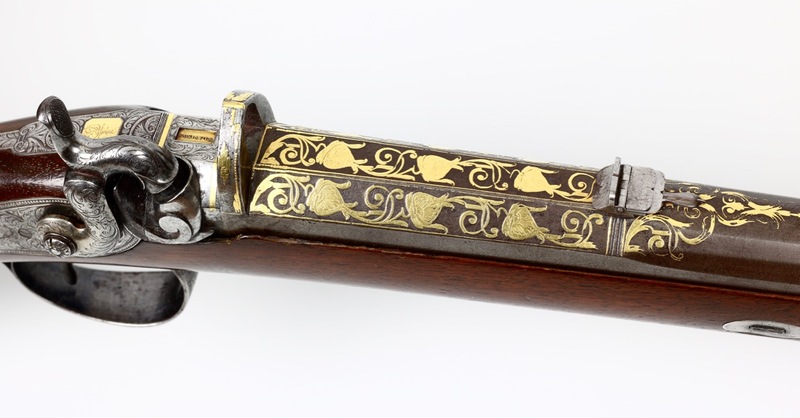 An English rifle that was built around an 18th century Ottoman barrel of the finest quality. The rifled, large caliber barrel is facetted at the breech and turns into a milt teardrop shape cross-section before flaring it towards the muzzle. It is constructed entirely of exceptionally fine twisted "damascus" steel. The muzzle with bulging monster head, a revival of similar designs on earlier barrels. It has a typical Ottoman arch-shaped rear sight, which normally is perforated with a number of small holes to adjust for elevation. The English gunsmith cut the arch open to allow the use of a more traditional English "folding leaf" sighting mechanism, adjustable for three distances. 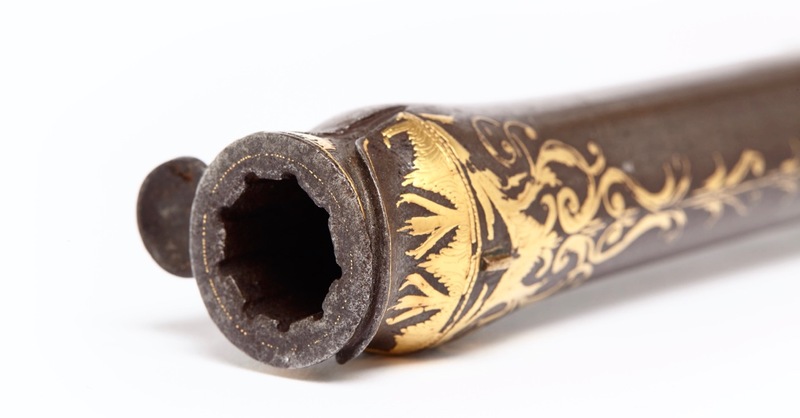 The barrel is lavishly decorated with golden damascening at breech and muzzle, with designs of tulips in typical Ottoman style. 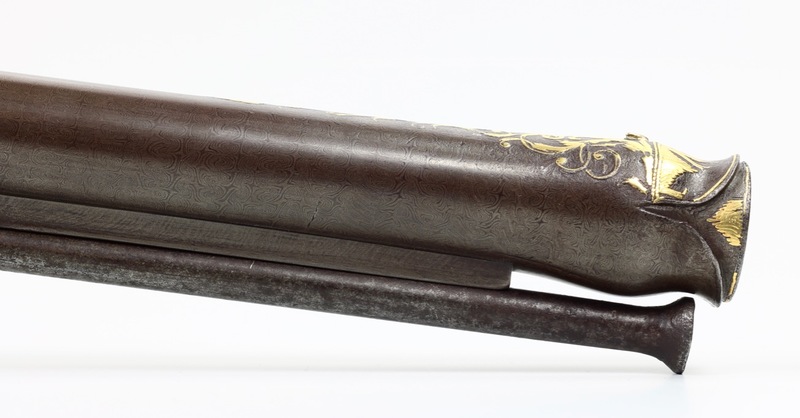 Undoubtedly made for a "miquelet" style flintlock originally, the barrel was skilfully converted to a percussion cap mechanism. This was truly cutting-edge technology for its time. A bar was welded under the barrel to enable the English mounting style where the barrel is secured to the stock by means of a wedge. This bar was twist forged by the English gunsmith to match the original construction of the Ottoman barrel. 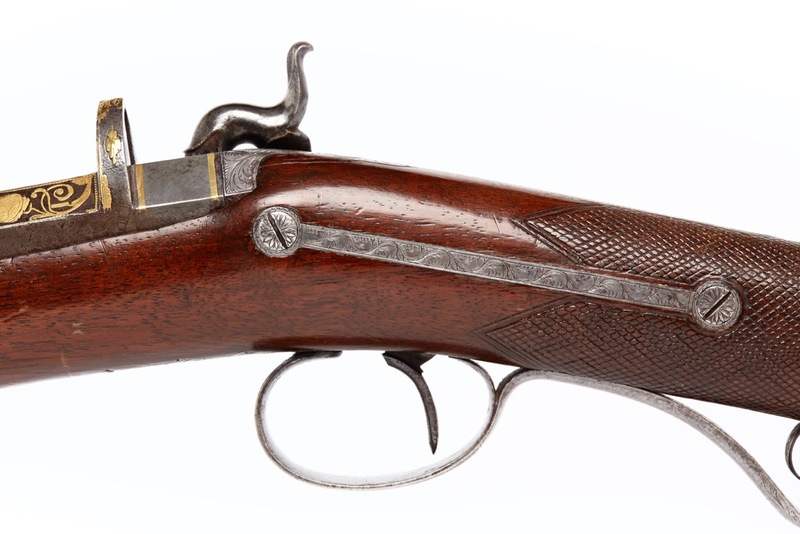 A most sympathetic job, resulting in a conversion that shows considerable respect for the original barrel, keeping true to some of its original the aesthetics while applying the latest technology to its firing mechanism. 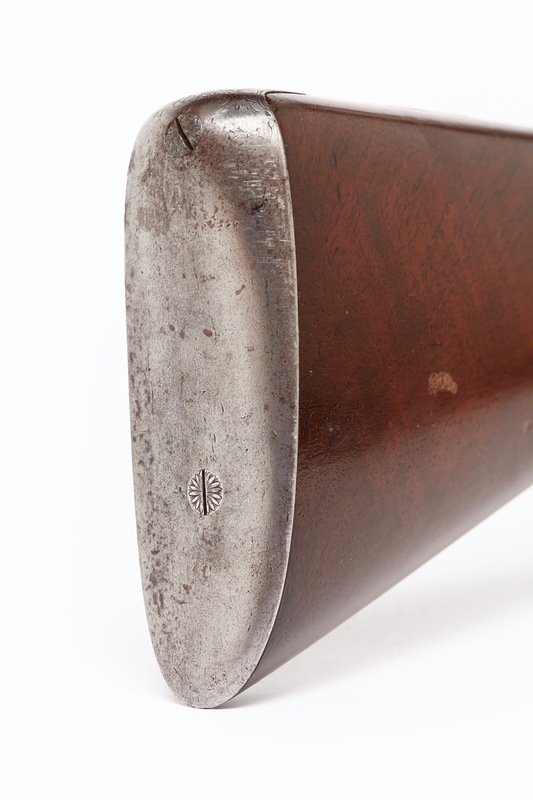 The barrel is mounted in an English halfstock style, typical for sporting guns. Considering its large caliber, it was most likely intended for the large game hunt. 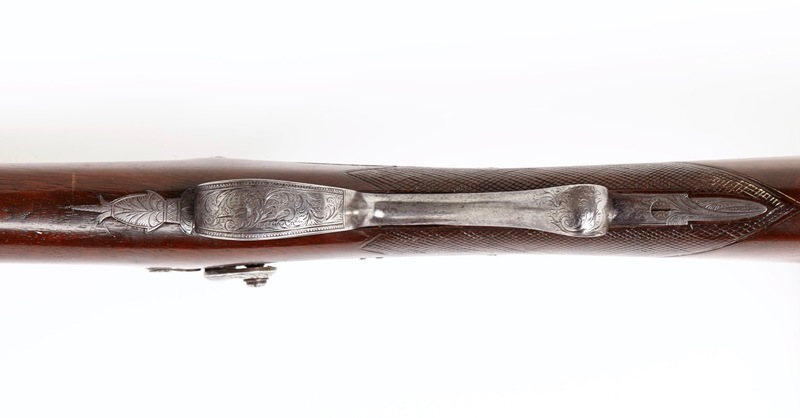 The English stock features beautifully engraved steel parts. 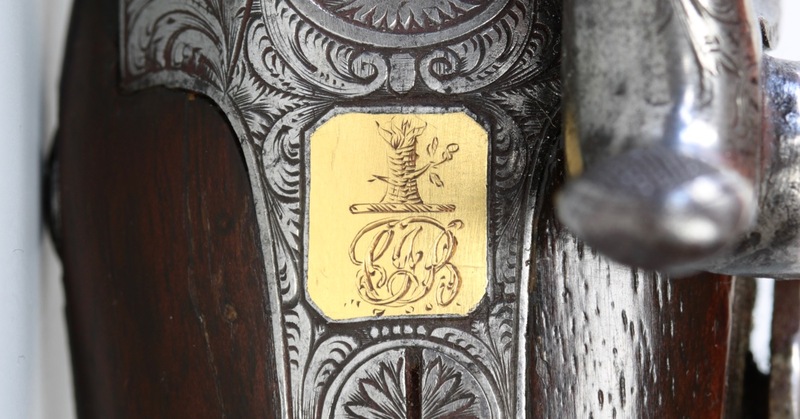 The gun has maker's marks and features the initials and family crest of its owner, and as it turns out there's quite a story to both of them. The gun carries the family crest of the Brandlings of Newcastle, a famous and wealthy family of merchants, and coal owners. It further carries and the initials C.J.B., attributing it to Charles John Brandling (4 February 1769 – 1 February 1826). He was member of Parliament for Newcastle from 1798 to 1812. Himself also a coal owner, he was a patron of science and technology, with a keen interest in steam power engines and safety mining lamps. In 1815 he chaired the committee set up to establish the remuneration to be paid to George Stephenson for the invention of the Geordie lamp. The safety lamp was a welcome innovation after some unfortunate accidents in his coal mines that had cost several lives. He also founded the Northumberland Pitt Club and became its first president. In 1819 Brandling formed and commanded the Northumberland and Newcastle Cavalry, a militia force dedicated to preserving the middle classes from riots. In the general election of 1820 he was elected "Knight of the Shire" for Northumberland, which he remained until his death in 1826. A friend of the family, Charles Grey (2nd Earl Grey) described him and his wife as "cordial in their manner, unaffected and extremely good-natured " Grey was later to become Prime Minister of England from 1830-1834. 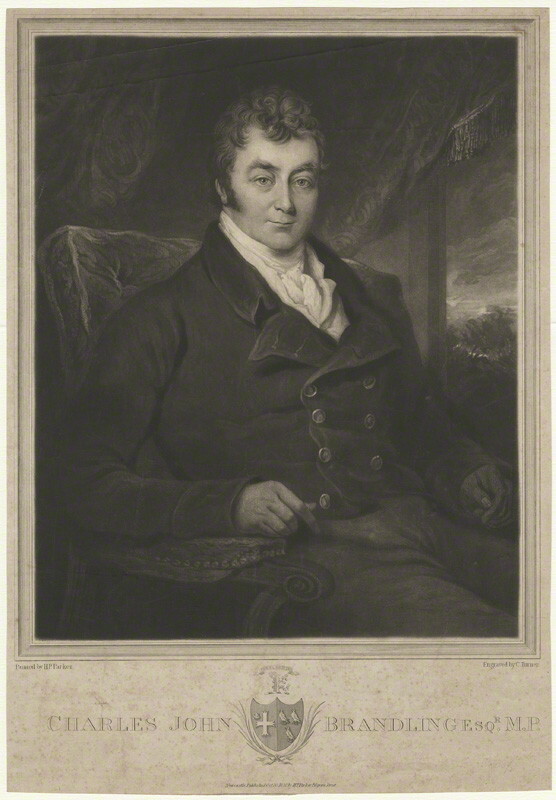 Portrait of Charles John Brandling by Charles Turner, after Henry Perlee Parker, 1820. National Portrait Gallery accession number D32087. 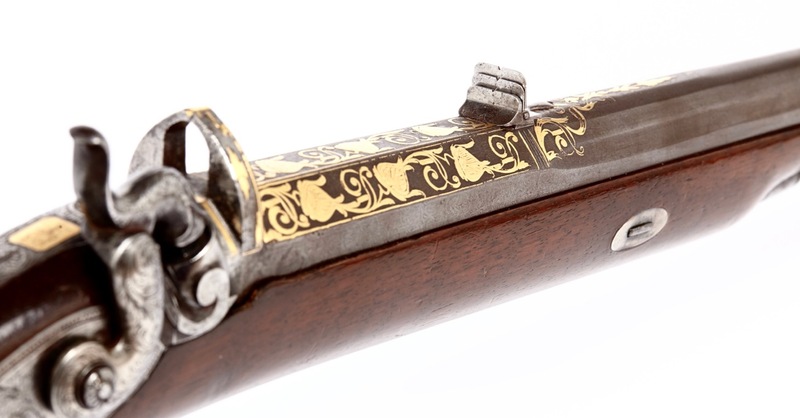 The gun is engraved on the side with "Davison Newcastle". 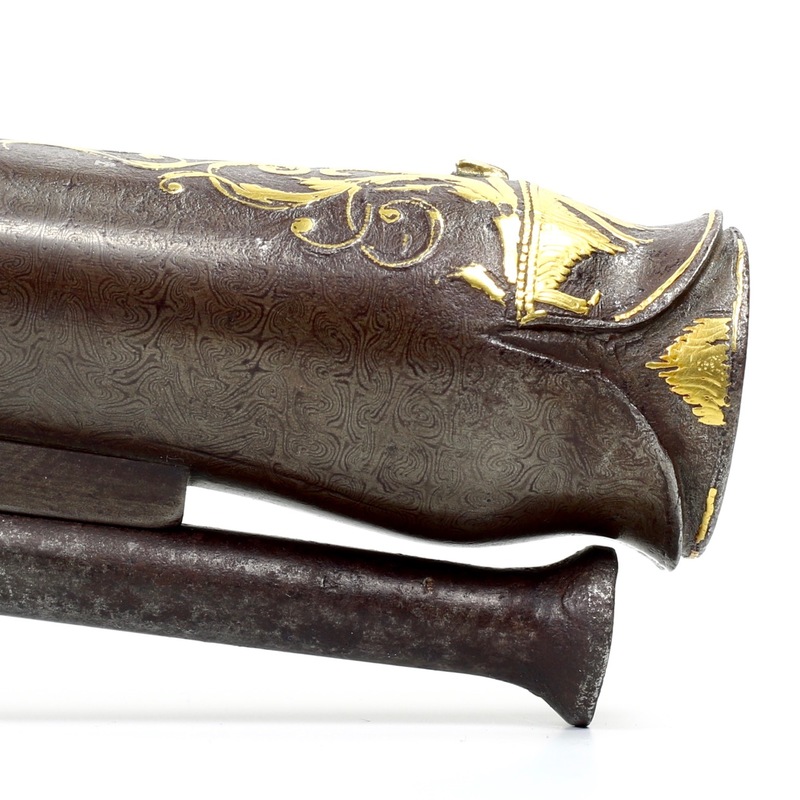 The Davisons were a family of gunmakers originally from Alnwick. 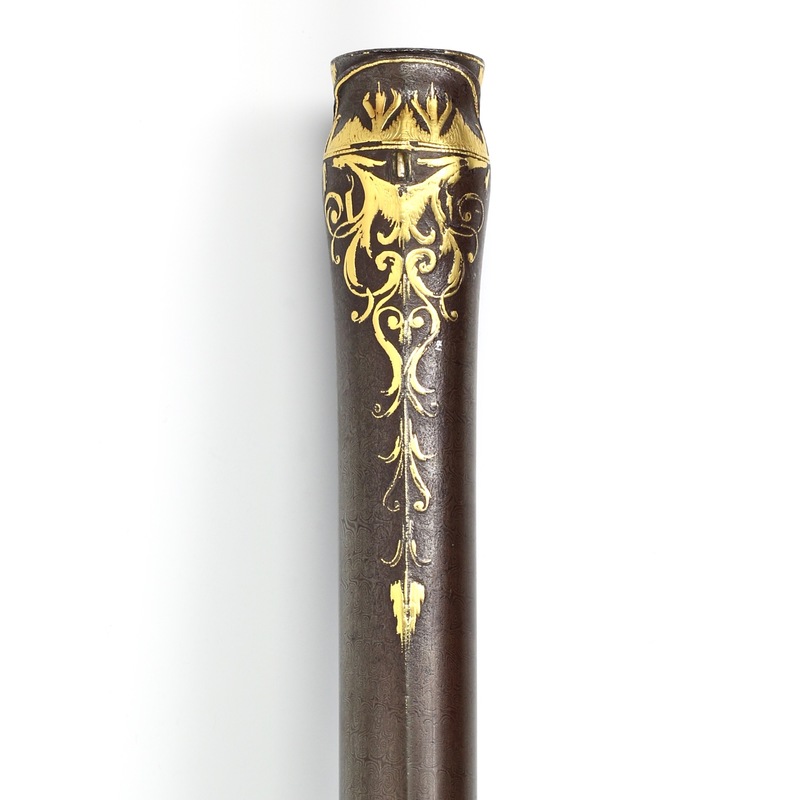 The lineage started with Thomas Davison, originally a cutler who later became a gunsmith. His two sons took up the trade, George (born 1783) and William Davison (born 1785) who both set up their own shops. George with shops in Alnwick and Newcastle, his brother David in Newcastle. They were of high repute. Interesting family detail: George Davison lost his wife prematurely, after which he re-married Mary Anderson, also a gunsmith. It was very rare at the time for a woman to be a gunsmith. Strong personality ran in the family, her granddaughter was no less than Emily Wilding Davison, a militant suffragette who died after throwing herself before the king's horse. After George's passing in 1927, Mary Davison ran her own shop with her two sons for a while, which she tutored, before filing for bankruptcy and joining William in his shop in Newcastle in 1838. According to a 1927 publication William Davison (1785 - 1870) had shops at two locations, 21 Westgate Street and 29 Collingwood Street.3 After his brother's passing in 1827, William seemed to have taken over George's shop at 63 Pilgrim Street in Newcastle. The building is still there today. Period newspapers of Newcastle often had advertisements by William Davison, gunmaker, not promoting his guns but instead handing out rewards for lost dogs. Each lost dog has a different name, so he probably bred hunting dogs on the side, some of whom escaped the shop every now and then. 52. The Curlew (Numenius arquata, Lath.). 53. Jay (Corvus glandarius, Lin.). 54. Hooded Crow (Corvus comix, Lin. ), fine specimen. 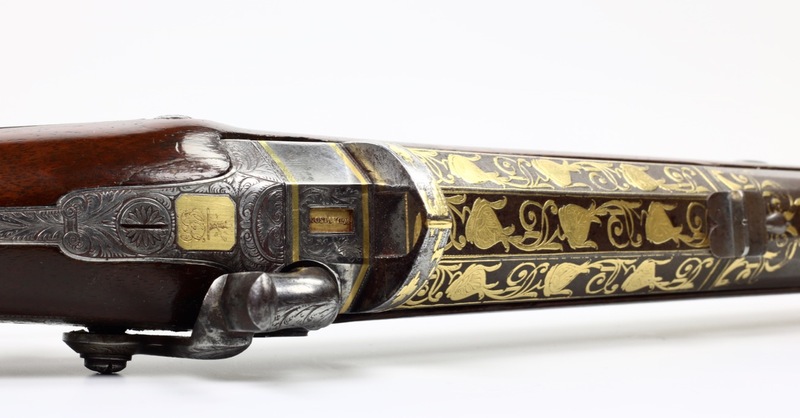 Apart from their apparent active participation in the local hunting scene, the Davisons were highly regarded as gun makers. 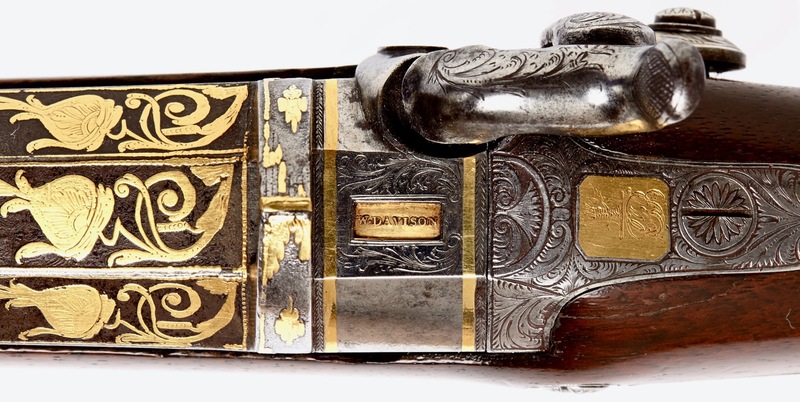 Examples of guns made by the Davisons are preserved in notable museums like the Royal Armories in Leeds. 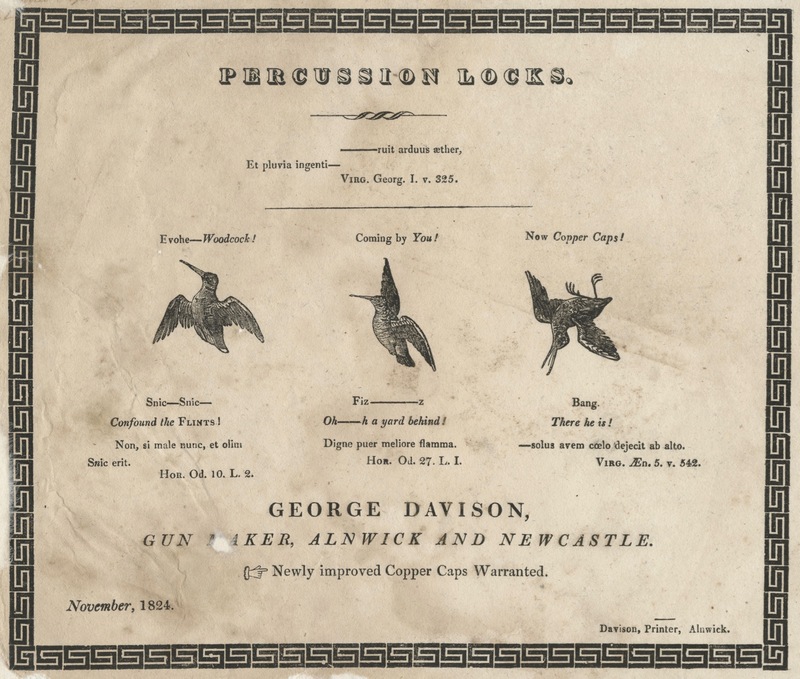 A 1822 advertisement by George Davison, promoting how the latest percussion cap technology helps with shot timing. In very good to excellent condition overall. Al metal parts without damage, barrel retaining its original browning throughout. The wooden stock with some regular age-related dents and scratches, to be expected from a piece that is about 200 years old. Significant by itself for the exceptional quality of the Ottoman barrel, a work of art in its own right with tightly forged out of twisted rods. It retains almost all its typical Ottoman golden decor. 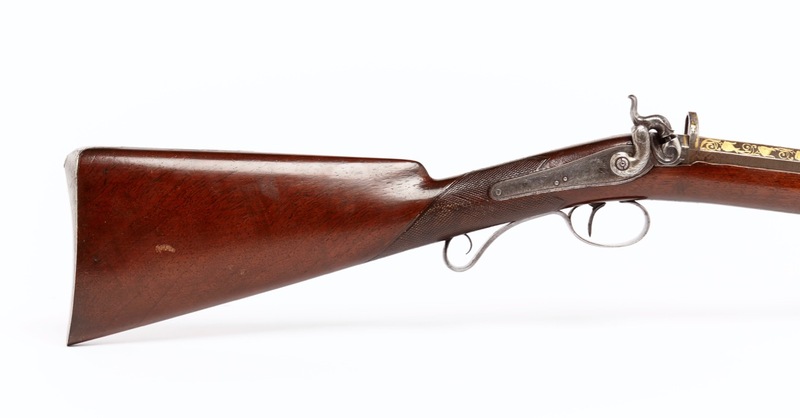 The mounting as an English sporting rifle is also a top quality job, respectably fitted with parts made to match, some using the same twisted rods method as used on the Ottoman barrel. 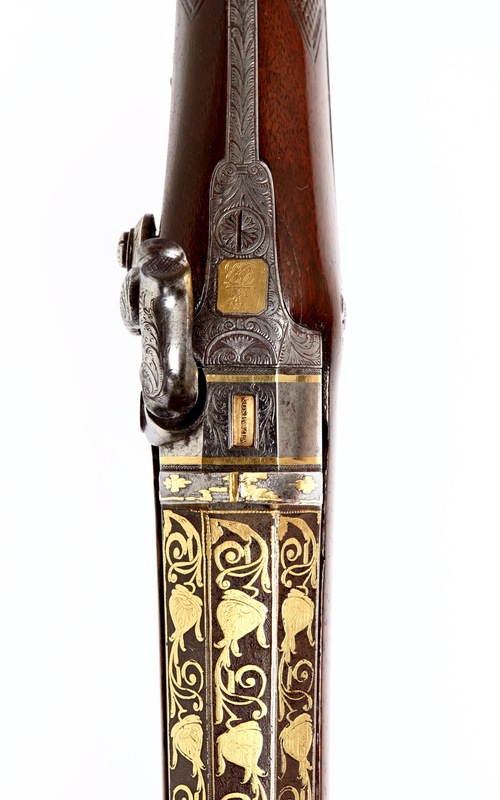 Given the death of Charles John Brandling in 1826, and the widespread use of percussion caps from the early 1920's onwards, the gun was probably made between 1820 - 1826. It represented the latest technology at the time. 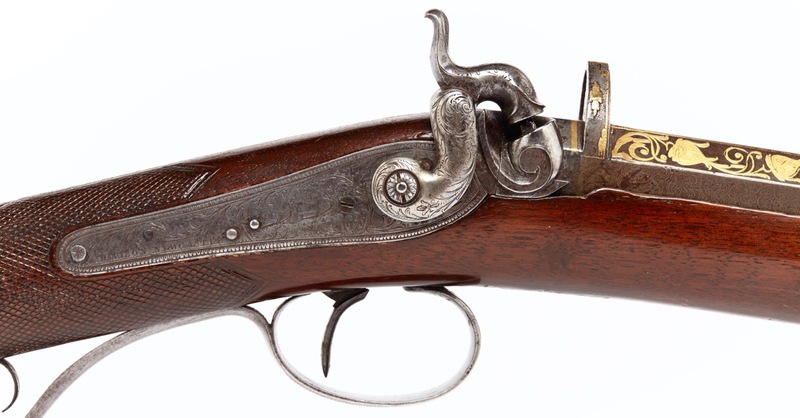 No other guns by the Davisons are known with foreign barrels. It is unclear how the somewhat older barrel was obtained, perhaps through Charles John Brandling's political contacts in London. The rest of the stock is finely engraved in the typical style used on high-end English sporting rifles. It proudly bears markings of both maker and owner, the former of high repute and the latter an important local figure and Member of Parliament. It is a piece of great quality, in excellent condition, and of historical significance. 1. See Robert Hales, Islamic and Oriental Arms and Armour: A Lifetime's Passion, Robert Hales C.I. LTD, 2013. Number 650, pages 268-269. 2. See the website of Friends of Middleton Park for extensive information about Charles John Brandling, his estate, and his family tree. It also cites the sources for the information stated in this paragraph. 3. See William Parson, William White (of Sheffield); History, Directory, and Gazetteer, of the Counties of Durham and Northumberland , W. White & Company, Durham, 1827.